Jimmie Rodgers, "the father of country music" and the first performer elected to the Country Music Hall of Fame, was a folk hero in his own lifetime, and has been idolized by fans and emulated by performers ever since. His life has been particularly susceptible to romanticizing, marked as it was by humble origins, sudden success and fame, and an early, tragic death from tuberculosis. Nolan Porterfield's definitive and highly readable biography banishes the rumors and myths which have long shrouded the Blue Yodeler's life story. Unlike previous writings about Rodgers, Porterfield's book derives from extensive and detailed research into original sources: private letters, personal interviews, court records, and newspaper accounts. 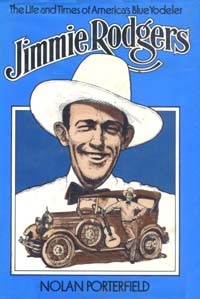 JIMMIE RODGERS significantly expands and alters our knowledge of the entertainer's life and career, explaining the nature of his role in American culture of the Depression era and providing pages of insightful background on the milieu in which he worked. Reading the first full account of the Singing Brakeman's childhood and adolescence, fans may be surprised to find that his early years were considerably less austere than previously reported, and that the railroad, although important, was not the dominant force in his life. Readers will also learn the details, never before published, of Rodgers's first marriage, and of the bitter lawsuit which centered around the only child of that marriage. Music specialists will welcome the abundance of information on Rodgers's recording sessions, including newly discovered facts regarding the circumstances of the original session in Bristol, and data on the performers, managers, and other show business figures who worked with Rodgers. An extensive discography, an itinerary of Rodgers's personal appearances, a chronology of the famous "Blue Yodels," and abundant illustrations give JIMMIE RODGERS even greater appeal and utility. "Not only has Porterfield given us the most complete and accurate account of Rodgers that we are likely to get; he has also provided some of the most valuable insights about early country music, and the South, that can be found in any published work." Bill C. Malone, author of Country Music, U.S.A., and coeditor of Stars of Country Music. Nolan Porterfield is professor of English and writer-in-residence at Southeast Missouri State University. A Texas native and lifelong Jimmie Rodgers fan, his previously published works include an award-winning novel, "A Way of Knowing," and numerous stories and articles in such magazines as "Harper's", "The Sewannee Review", and "The North American Review."